The crunchy sweet corn and the spicy flavorful rice make this dish a delicious one-pot meal. • Wash and soak the basmati rice for 30 minutes. • Grind all the ingredients for the masala using a little water to make a fine paste. Keep it aside. • Place a pressure cooker on medium heat; add oil and ghee, and all the ingredients required for the tadka. Add ginger-garlic paste and sauté for a minute. • Add the sliced onion and sauté till they turn light brown. Add the masala and cook until the strong smell disappears. 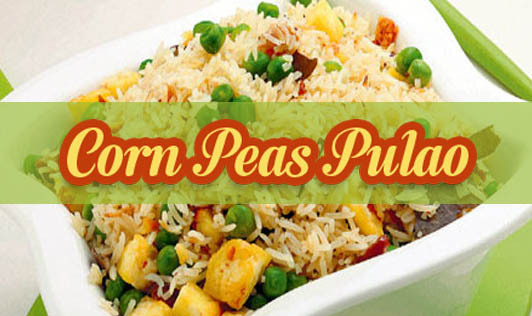 • Add the corn and peas, and sauté to mix the vegetables with the masala. Drain water from the soaked rice and add rice to the masala. Sauté for a few minutes. • Season it with salt and pressure cook (3 whistles) on a medium flame. • Fluff the rice with a fork after it cools down a bit. Take care while doing this as the rice can break. • Serve immediately along with the curd or raita. • You can skip the peas if you want or you can replace it with other vegetables. • Keep the water ratio as 1:1.5 cups while cooking presoaked rice to achieve dry texture.